Twenty years ago, inside the infamous Chelsea Hotel in New York, Elizabeth Peyton held her seminal exhibition. Located within Room 828, visitors were invited to retrieve the room key from the front desk and let themselves in to view a series of her intimate portraits. The show only lasted two weeks, but ignited a long-term partnership with art dealer Gavin Brown, who curated the exhibition and assisted in launching Peyton's prolific career. "Peyton...has dedicated much of her career to portraiture; something she simply describes as making 'pictures of people." Her works are often small in scale. But it is through washed-out tones and rigid linear mark-making that Peyton reveals intimate details about her subjects. She works from both life and from photographs; documenting friends, family and modern pop icons such as David Bowie, Kurt Cobain and John Lennon. In her current show at Gavin Brown's enterprise, which marks two decades since her Chelsea Hotel exhibition, Peyton has produced a new series of portraits and still lives. Here, she speaks to AnOther about the show and why putting art out in the world is a challenge. This show marks twenty years since the seminal Chelsea Hotel exhibition. What memories do you have of that early show? I can remember looking for Sid and Nancy's room at the Hotel with Gavin [Brown], but it turned out that it didn't exist anymore and tipping in the xeroxed pictures into the little catalogue that we made 100 of. You have often discussed the importance of putting your images out in the world, for example housing them in public spaces, a pub in London or at the Chelsea Hotel. Why is that important to you..
A few reasons: putting artwork in the world is a challenge in that all kinds of people will be seeing it – not just people choosing to see it. So it needs to be human and direct. I feel I want that for my work that all people can "see" it and take it in to themselves. "Putting artwork in the world is a challenge in that all kinds of people will be seeing it – not just people choosing to see it. So it needs to be human and direct"
Can you discuss some of your new subjects in the new Gavin Brown show? This show is all pictures of people: some artists, some singers, many pictures of the German tenor Jonas Kauffman, some works inspired by Wagners Parsifal that was here in NYC February-March, Peter Gelb the Met Opera General Manager, the German soprano Waltreud Meier and some pictures of Elias Bender Ronnenfelt. I've been generalizing, saying its my Parsifal/ Ice age show. Would you say that your drawings are they more of the moment than your paintings? Yes, mostly. Although it’s changing a little bit and sometimes i'll work on drawings over a few months to a year. Finally, many of these new works are portraits of friends. How important is love, friendship and that intimacy in your work? 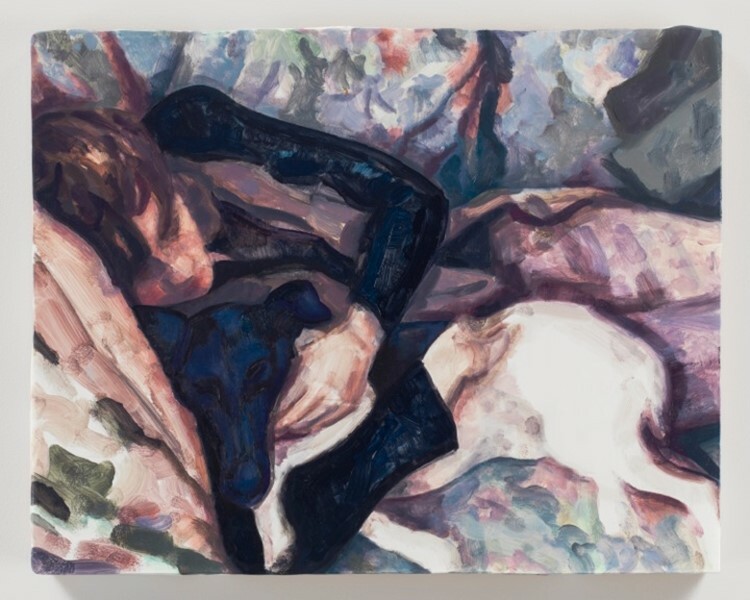 Elizabeth Peyton is at Gavin Brown's enterprise until May 13.